We have transcribed a few of the older reviews below. Captain Alex is the Best!! We decided to rent through Blue Caribbean after seeing their name in a brochure and honestly, this was a godsend! From Patrick, who arranged the reservation for us and was so friendly (and hilarious) over the phone, to our wonderful Captain Alex, we really had the time of our lives. We had no idea where we wanted to go so we put our trust in Captain Alex to take us to the "best spots" in his opinion. We ended up swimming with sea turtles and sting rays, jumping off the Willy T's floating bar, having lobster quesadillas at One Love, the famous "pain killer" cocktails at the Soggy Dollar, and even closed out the evening with another floating oasis called the Pizza Pi. And to top it all off, Alex had killer taste in music and the sound system on the boat was amazing!! By the end of the trip, Alex really felt more like a friend than our "tour guide" for the day and he even helped us out with recommendations for places to go on St John the following few days we spent in the Virgin Islands. Without Alex, our trip surely wouldn't have been the same and I would encourage everyone who goes to the USVI to book through Blue Caribbean and request this guy--he's the BEST! We booked Caribbean Blue Boat Charters for a trip over to the BVI's....and it was AWESOME!! We all had a most wonderful time, it was pretty much one of my favorite days I have had since moving here! There were 10 of us, and the boat easily fit all of us, and our huge cooler of booze! We went out on the Voodoo (SICK boat) I think it had twin 250's or 300's....anyway, it was FAST! AND....it had an AWESOME SYSTEM! The music was on point for an awesome party day!! The water was a bit rough that day, but it really didn't matter because our captain and the boat were great and got us to our destinations quick and easy! We went to Jost for a bit, played on the beach and got Painkillers at Soggy Dollar Bar, then hopped over to Norman Island to go play at the Willy T and have some lunch over on the island. It was awesome and a great day! Captain Alex was absolutely perfect and made the day so much fun! He took us to great locations in the BVI's and we all had an absolute blast! He was great with the boat and made all the customs/passport stuff quick and easy, it was pretty much a perfect day! I HIGHLY recommend Capt Alex and Caribbean Blue Charters for a fun-filled day out on the water you won't soon forget! Best Day in the Caribbean! What a perfect day! The charter was fabulous. Captain Owen knew all the best places to visit and his Caribbean Blue boat - Karma cut through the water with ease and agility. Being a boat owner myself, I was not only impressed with his knowledge of the area, but his boating skills were second to none. Caribbean Blue hosted a perfect day on the water. Got to experience many of my St Thomas bucket list destinations all in one day. Visited Saba Rock, Scrub island, Virgin Gorda baths, discovered cannons while snorkeling on a reef, saw Nekker island, stopped at Willie T's for a few high dives and swam in St Johns best coves. A full day hosted by a fabulous company with a fun group of people. Can not say enough about them. There may be a lot of boat charters to choose from but Caribbean Blue is the best and only one in my books. 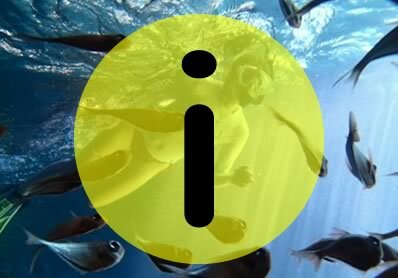 Your vacation time is limited. Book with someone who understands quality customer service. Look forward to another voyage with you. We WILL be back! Amazing Day with Capt Owen aboard Karma! We chartered "Karma" with Capt. Owen w/ 2 families (4 children ages 8-13) to go to BVI (The Baths) for the day.Owen was great with the kids and an amazing captain,the ride was smooth & beautiful.A child had a run-in with fire coral and he was quick to act and even ran to the pharmacy for us while we ran to the store to get vinegar.He played kid appropriate music on the boat that they loved and made sure everyone was having a great time.I would highly recommend both the boat Karma and Capt. Owen. Great day with Capt Don aboard Karma! We chartered Karma for a trip to the BVIs for 9 people. Capt.Don was very knowledgeable and Karma was clean and well equipped. He suggested making a few changes as to the order of our stops in order to avoid the larger crowds at Soggy Dollar. We visited Foxy's while he checked us through customs, then Soggy Dollar, then Sandy Spit and on to the Willy T. and a little snorkeling at the Caves. The boat had a great sound system. The charges were just as they had prepared us for with no surprises. This was our 4th boat trip in the BVI's and we were very pleased with Caribbean Blue Boat Charters..We definitely recommend them! 7 of us rented out this all day boat tour for the day which is about 8am till 5pm . You will need a passport because you will probably stop at some of the BVI's . Don't let it scare you if the captain says there are 4 to 6 ft waves there not bad at all. I just wouldn't go out to Virgin Gordo to see the Baths because it takes too long to get there in the rougher seas and you won't have much time to do much else. But the ride was great. Ask your captain for recommendations for that day. We had Captain Doyle and he did a great job . This is a must thing to do at least twice while your down in the VI's . Stopped at the Soggy Dollar Bar in the BVI's . One word Beautiful. You could spend a whole day just at this beach and bar restaurant . Hope to see Caribbean Blue Charters again. An incredible day! Can't wait till next Thanksgiving! We had 2 families with 2 kids each, ages 8 through 11 and had an incredible day. We went to "One Love"on the beach for lunch on Thanksgiving Day and were invited to join the owner and his family for a big festive meal on the beach. They had warming trays with huge amounts of local food and cooked fresh fish on the grill. They took the fish off the grill and broke the fish in half so it was easy to remove the meat with our fingers. CRAZY FUN! It was an incredible experience that we’ll never forget! Thank you Dan Perez and Doyle! The Marshalls 8 had the best time with Captain Owen and his mate aboard his "Karma". Owen was professional, fun, had great music, and safety oriented. He did what we wanted to do and had perfect suggestions. 10/10. Thank you Owen. My family chartered a boat on March 11th. We wanted to go to the BVI but several members of our group didn't have passports updated. It still turned out great. It was the best day yet as we snorkled spots on St John, Christmas cove, pizza cooked on a boat and Buck Island. Capt Owen knew all the best spots to visit. Next time we'll do the BVI. Definitely worth it!!!!! 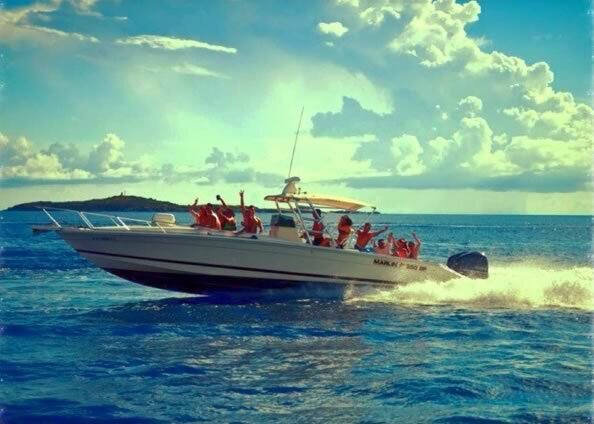 We chartered Caribbean Blue to take a group of 12 friends to British Virgin Islands and had SUCH A GOOD TIME! The boat was incredible and had a great sound system, which I wasn't expecting. Captain Owen took care of everything for us... he made the trip a lot of fun but he obviously always had safety on the forefront of his mind. And he played great music :) We take a trip to the VI almost every year and I think we will be chartering Captain Owen and Caribbean Blue for a different trip every time we're there! Perfect Virgin Islands Boat Trip and snorkeling day! Our family of 10 had the pleasure of spending the day on Voodoo with Captain Doyle. 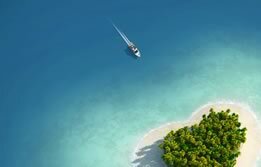 We had our hearts set on going to Virgin Gorda, but Doyle recommended a trip to closer islands given the ocean conditions. We were glad we took his recommendation and had a wonderful time snorkeling around Norman Island and The Indians. The boat was immaculate and the ride fairly smooth given the conditions. There was more than enough room for 10 people. I would highly recommend chartering a boat with Caribbean Blue. Dave and Heather - THE BEST!!! Had a great day . Two of our friends didn't have passports so couldn't do BVI but Dave and Heather made up for it Big Time !!!!! One of the best times I've had in my life ! Snorkeling, Island Tour and Beach Bars ...... My friends and I couldn't of asked for a better trip or better people . Ask for Capt Dave you won't regret it . - Billy Boston Ma. We went on a boat trip to the BVI and I must say it was fantastic. The boat that capitan Don used for this trip has been the best boat I have been in. He took us to the best spots including the gorgeous baths. 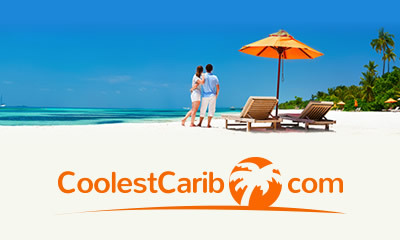 This is a super professional company and I truly recomend it for future boat trips in USVI or BVI. The also have the best deals in the islands. Any day on the Water is a great day - This was fantastic! Captain Doyle met up with us on the morning the day after Christmas. 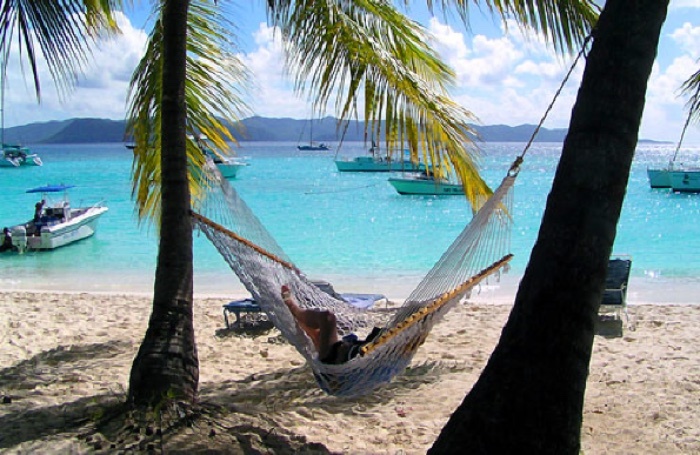 The day after Christmas can be such a let down, hence the reason boat trip to the BVIs. Being avid boaters we were eager to get going, Captain Doyle went through the vessel safety check and review with us and we got under way. Captain Doyle asked what we would like to do and we went over the options. We decided to do the Caves off Norman Island, The Indians, snorkeling on the back side of St Johns while we finalized our customs requirements, Pirates Bite for lunch, passing Willy T's barge on the way, and wrapping our day up at The Soggy Dollar Bar. The trip was phenomenal, blue water, blue sky, a great boat, and a great captain. All summed up to a fantastic day on the water. I would highly recommend this to everyone who is contemplating a boat trip to the BVIs. Fantastic Day of Cruising, Snorkeling, and Relaxing in the Virgin Islands. Her family of nine reviewed the boat for the day. Toured the USVI waters and beaches of Water Island. Outstanding service from a knowledgeable captain, a very comfortable boat, and an outstanding day overall. Would definitely rent from them again. Price for the outing was very competitive with other offerings in the market. Perfect day was had with the 7 of us, aboard the 35' Marlin, "Karma", and Captain Owen Aschoff! Professional, knowledgable, accommodating, and just a great day on the water. With Owen at the helm, that boat was the smoothest, driest, most comfortable open center console I've ever been on. Professional operation from the very beginning. Captain was very knowlegable and personal. Went to Willy T's, Pirates Bite and Jost. Great boat, amazing sound system. If you're looking for a casual cruise or a PARTY, this is the company to book with. We rented one of their boats for the day and were blown away by the experience. They were prompt, courteous and accomadating. The boats are very well maintained, spacious, and overall super nice. The captain was friendly and took us where we wanted when we wanted. We created our own trip. Tortola, Willy T, Sandy Spit, and Jost Van Dyke. The was the best day on our trip and would not hesitate to go again and caribbean blue would be our only choice! I use Caribbean blue any time family comes to town! The boats have a great sound system and r lots of fun. Last time we went we actually rented 3 boats on the same day and put a large group together and it was a blast! We went to Sydney's for lunch on Jost and of course soggy dollar! Ask for Captain David! He is the best! We booked with caribbean blue to take my family to see the baths on virgin gorda and the boat rocks! It handles the water so well and has plenty of shade! My family loves the trip. I have been on several boats out here and this has by far been the best so far! And our captain Don showed is places I have never been! He is witty and personable! Always telling stories about the places we r visiting. Really makes the day fun! Ask him to play the shark music. It's awesome! What a great way to spend a day on the water! Caribbean Blue was a cinch to work with and our captain, Captain Arley, was easy going and great with teen-agers. He knew all the great places to snorkel. We swam with sea turtles, saw amazing fish, and even got face-to-face with a spiny lobster. After lunch we took an awesome site seeing tour around an island and saw some amazing houses. Our 14 year old and 12 year old had a blast. We will definitely do this again! With the Caribbean as my back yard...tell me again why I live in Tennessee? Not sure...but today was absolutely breathtaking. Thanks Doyle for being such a fun captain. You made the day carefree and easy. Our wish was your command...and as an early 50rh birthday celebration for me that was much appreciated. We will be back next year and will be calling Caribbean Blue again. Worth the Money!!! Best Day Ever!!!! One of our favorite things we did on our trip. It was perfect for all ages. I have a 16,13, and 8 year girls, they loved it. I am planning my next trip and charting a boat is on the list but for 2 or 3 days. It was a perfect day! We booked a private tour of the surrounding islands for 5 of us. Captain Don was awesome and took us to see some of the most amazing areas around St. Thomas and the USBVI. Captain Don offered us great recommendations to make our entire day a customized experience for our entire family. He knew a lot of the history, local lore, and was great at giving us insight into the life of the islanders and tourist areas. I would highly recommend and would definitely book again! We were captained by Doyle, who was amazing and fun to be with. The boat was fast, smooth and the music was awesome! We came into St Thomas on a cruise ship and only had a limited amount of time. We really wanted to go to the baths at Virgin Gorda. Doyle made it happen! 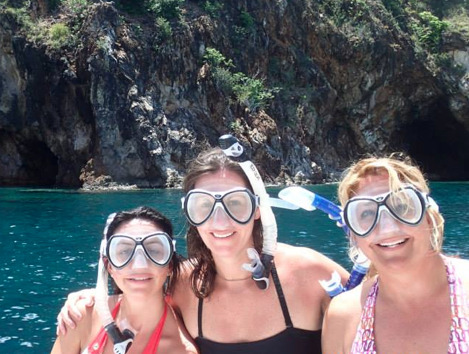 Not only did we get there and enjoy the baths but we also did some amazing snorkeling around the area as well. We were back to our ship with plenty of time to spare even with some sight seeing on the way back. Doyle was an amazing captain, the company was excellent to work with, I would recommend Carribean Blue to anyone and will be using them again in the future. Thanks! We hired these guys last minute, and it couldn't have been better. Captain Don was awesome. He took us everywhere and finished with a high speed run back to St. John with American Pie playing int he background. Absolute awesome trip and worth every penny. Our captain JC took us out on the Voodoo for a day trip to St. Johns and the B.V.I. My whole family could not stop talking about the experience. From the time we boarded when all the safety features were explained and JC told us we could go where ever we wanted for the day. Caribbean Blue Boat Charters is a first class adventure I'd recommend to anybody. Capt. Doyle Showed Us a Great Day in the Islands! Our trip with Capt. Doyle on the Voodoo last summer was one of the highlights of our annual St. Thomas trip, so, of course, we were going back. We'd enjoyed the day so much, in fact, that our initial intention was to pretty much replicate the tour. The ocean, as it turned out, had different ideas. It was a bit rough that day, so Doyle mapped out an entirely different route to avoid the really choppy stuff as much as possible. Lucky us, because it was a completely different experience, but every bit as good (if not better) look at the more low-key and laid back British Virgin Islands. After a bit of snorkeling, we made our way out to the B-Line Beach Bar, where we pretty much had the place to ourselves. A bunch of us played corn hole (the bean bag game) and sipped a local drink (the B-Sting, if I recall correctly). After another route set to avoid the worst of the water, we settled in for a great lunch at Taboo, which featured a picture postcard view of the docked boats and water that seemed to go on forever. A bit later, it was on to the legendary Soggy Dollar, where we tossed down a few Painkillers and took in the sights of one of the islands' truly unique attractions. It was the perfectly relaxing ending to a delightful if somewhat unexpected day. Doyle is a musician, and the music on the boat definitely enhanced the day. He's also a good guy and a terrific host, and he works hard to make your day special. We've had two great experiences with him, and we plan to go for three next summer! Doyle was our captain for the day and from the time we boarded the Voodoo until the time we got off the boat our entire family had a smile on their face. He took us to some of the most awesome places one can imagine. We started with awesome snorkeling where we saw sea turtles and stingrays, then on to the BVI's for drinks and great food. Our family felt like we've known him for years by the end of the day. He played great music and made everyone feel safe and relaxed. I would highly recommend the trip, you won't be disappointed!! My husband and I were traveling with our 2 teenage children. Captain Doyle was very helpful in creating an itinerary that made all family members happy. We felt right at home on the boat cruising, relaxing and listening to a great playlist! 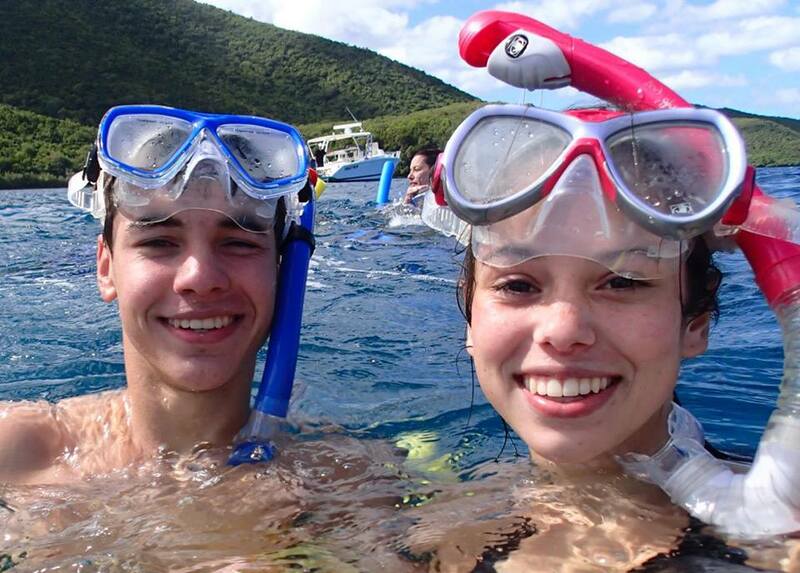 We enjoyed several snorkeling stops in both the BVI and USVI. He made going through customs efficient to allow us more time to play. We had an excellent lunch at Foxy's Taboo on Jost Van Dyke as well as a short hike to the "Bubbly Pools". We also enjoyed a stop at Sandy Spit for a nice swim and relaxation on the beach. The pre-trip email was very accurate and informative so there were no "hidden fees" or surprise costs at the end of the day. Caribbean Blue Boat Charters was certainly a highlight of our week on St. Thomas. The cost is not insignificant, but it is well worth the splurge! I would not hesitate to recommend it, especially for families with teens. We had arranged a tour with Caribbean Blue for a pre-planned itinerary - so we were pretty excited to see the VI's from boat. The day of our tour, the weather was less than stellar - so we just put the itinerary in the hands of our Captain. What an excellent experience. We went to five islands, a few private and we and our kids had a great time. The vessel was safe and I felt totally comfortable in their hands. The snorkel equipment was in good shape (pretty new) and the kids were able to swim with turtles. Just an excellent time and great value for the experience. Thanks to JC and all his kindness. 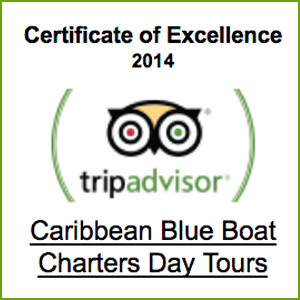 Caribbean Blue Boat Charters Day Tours - What an amazing day! Not only was the weather perfect-Captain Dave and Karma were as well! From the moment Dave met us, precisely on time, to our first snorkel stop between Congo and Lavongo, on to The Indians, then Willy T's, over to Sandy Spit and finally White Bay to experience One Love and of course-the Soggy Dollar-it was the most memorable day of our trip! Dave was exceptionally friendly, a very experienced and confident captain and had great taste in music! He made us feel like we were a part of his family and was very accommodating and tailored the day to our wants! The boat was very comfortable and we had some considerable chop. The pre trip email covered all of our questions and was full of good information. There were no "surprise" fees or charges and it was nice to have someone so knowledgable handle everything at customs in Tortola. Take plenty of sunscreen-not the spray kind! The sun is intense out on the water. The snorkel gear was practically new and very clean. We brought sandwiches, drinks and snacks and made sure we fed our Captain. The snorkeling was fantastic and we spotted a nurse shark on our first stop. Snorkeling at the Indians was like swimming in a giant aquarium-literally surrounded by fish. Willy T's was a memorable stop,and we could've laid around on Sandy Spit for hours-the most beautiful tiny island. The final stop at White Bay on Jost Van Dyke was the perfect way to end our day and Dave was so accommodating. 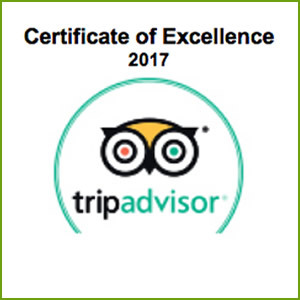 Thank you Caribbean Blue Tours-we WILL see you again! This was an awesome day (9/9) for our group of 5 with Captain CJ. We had been to St Thomas many times on a cruise but never had the time to do a day trip to Jost. This was our own day to do what ever we wanted and our captain was very informative and gave us great recommendations. Sorry CJ for packing up your food along with our own materials when were exiting the boat, tell your wife she makes a good sandwich. Captain Doyle designed a trip that went beyond the expectations of our family of four. We had a full day (8am-4:30)on the water, hosted by a very cool captain aboard a full service speed boat. I have already recommended Caribbean. Blue to folks I met in St Thomas. Our family agreed that "Sandy Spit" was our favorite stop with lunch at Willie T's a close second- jump off the top if you dare. Spent the day on the boat Voo Doo with Captain Doyle. We took our family of five (3 kids, youngest was 17) and had a great time. Started with a swim off of Hawksnest Bay on St. John. After checking in with Customs on Tortola, we headed over to Norman Island to snorkel the Indians, then to the caves for more snorkeling where we got to swim with a sea turtle. Lunch was right around the corner on the infamous Willy T, docked in Privateer Bay off of Norman Island and ended with a jump off of the upper deck of the boat. After lunch we headed over to Jost Van Dyke where we anchored just off the beach in White Bay and waded a short distance to shore. Our kids headed for the hammocks because they needed a break from the sun and we headed straight to the world famous Soggy Dollar Bar. Mic was behind the outdoor bar as expected, serving up Pain Killers, the drink made famous by the Soggy Dollar. Chairs are provided so we parked ourselves at waters edge with our feet in the water and our drinks in hand. It was so relaxing. The entire day was our schedule. No rushing to get to the next location. It was entirely up to us. Doyle made things run so smoothly. When we had our fill of White Bay (Is that really possible?!) we headed to Sandy Spit, the location for Corona commercials with the lone palm tree. It was awesome. We had it all to ourselves. What fun. The day was so special because it was entirely ours. We didn't want it to end. The music was great, too. Doyle took great care of us. He definitely knows his way around the blue waters of the Virgin Islands. Great experience. Would do it again in a heart beat!